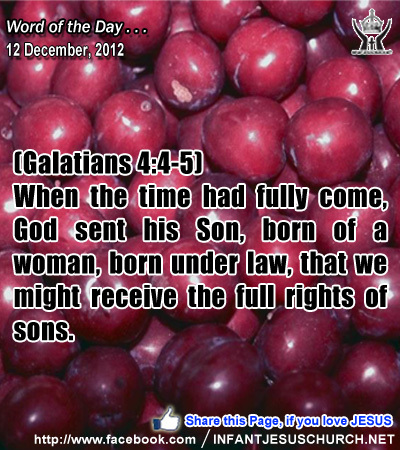 Galatians 4:4-5: When the time had fully come, God sent his Son, born of a woman, born under law, that we might receive the full rights of sons. Heavenly Father, even your name is precious to us. We gasp at how much it cost you to let us call you Heavenly Father. We don't understand such extravagant love, but we thank you for it. We know we don't deserve to call you Heavenly Father, but it sounds so right. Something inside resonates at the sound of Heavenly Father - Holy, Righteous, Almighty, Heavenly Father! While we know that we will never be a perfect child, we rest today in the confidence that we are your child and you claim us. Thank you in Infant Jesus' name. Amen. 28Come to me, all who labor and are heavy laden, and I will give you rest. 29Take my yoke upon you, and learn from me; for I am gentle and lowly in heart, and you will find rest for your souls. 30For my yoke is easy, and my burden is light." In the Advent season we rejoice the coming of the Messianic King who ushers in the reign of God. The prophets predicted that the Messiah would establish God's kingdom of righteousness, peace, and joy. Those who put their trust in God and in the coming of his kingdom get the blessings of that kingdom - peace with God and strength for living his way of love and holiness. Jesus fulfills all the Messianic expectations and promises of God's kingdom. That is why he taught his disciples to pray, "thy kingdom come, thy will be done, on earth as it is in heaven". In his kingdom sins are not only forgiven but disinterested, and eternal life is poured out for all its citizens. This is not a political kingdom, but a spiritual one. The yoke of Christ's kingdom, his majestic rule and way of life, liberates us from the trouble of guilt and disobedience. Only Jesus can lift the burden of sin and the weight of hopelessness from us. Jesus used the analogy of a yoke to clarify how we can exchange the burden of sin and misery for a yoke of glory, freedom, and joy with him. The yoke which Jesus invites us to embrace is his way of grace, power, and freedom to live in love, peace, and joy as God's sons and daughters. Do we trust in God's love and present to his will for your life? Loving Infant Jesus, inflame our heart with love for you and for your ways and help us to exchange the yoke of rebellion for the sweet yoke of submission to your holy and loving word. Set us free from the folly of our own sinful ignorance and rebellious pride that we may wholly desire what is good and in accord with your will.